The new PCCK510LA has a little less speed than we are used to at only 7,500 to 15,000 oscillations per minute, but it is said to provide double the run time of their 12V Max oscillation tool when using the 18v compact battery, and triple the runtime with using their high capacity 18V battery. The tool features a variable speed dial, and features a total oscillation angle of 2.8 degrees. The tool weighs in at 2.8 lbs with the battery (compact?) installed. 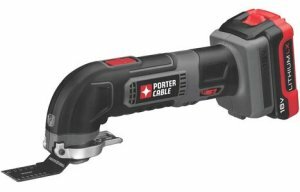 The PCCK510 will be hitting Lowe's and other stores this June. The PCCK510LA oscillating multi-tool kit is expected to retail around $169. The kit comes with one PC18BLX (compact) Lithium-Ion battery, one PCXMVC 18V Multi-Chemistry Charger, 32 accessories, an accessory box and a kit bag. The bare tool (PCC510B) will also be available in the back half of 2012 for $89.97. The bare tool also comes with the same 32 accessories.